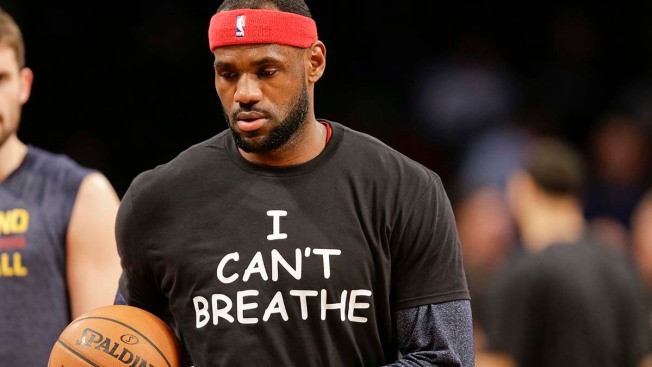 LeBron James, Kyrie Irving and multiple players on the Brooklyn Nets wore "I Can't Breathe" shirts as they warmed up for a game between the Cleveland Cavaliers and Brooklyn. Kevin Garnett and Deron Williams were among four Nets wearing the shirts before the game in support of the family of Eric Garner, who died July 17 after a police officer placed him in a chokehold when he was being arrested for selling loose, untaxed cigarettes. Chicago star Derrick Rose wore one before a game Saturday and James said Sunday he wanted one. He got it from Nets guard Jarrett Jack, who provided them to players on both teams. A few NFL players had the saying written on different items of gear and shirts during pregame warm ups before games on Sunday, including St. Louis Rams guard Davin Joseph and Detroit Lions running back Reggie Bush and Cleveland Browns cornerback Johnson Bademosi. "Obviously as a society we have to do better, we have to have empathy better for one another no matter what race you are, but it's more a shout-out to the family more than anything," James said before warming up. Irving had already gone to the court in his as James spoke. James said at the time it was a "possibility" he would do the same, and he was wearing the shirt when he unzipped his yellow and gray jacket in the layup line. The statement from the players came before a game that was to be attended by Britain's Prince William and his wife, Kate, as well as NBA Commissioner Adam Silver. "I respect Derrick Rose and all of our players for voicing their personal views on important issues but my preference would be for players to abide by our oncourt attire rules," Silver said. Players are required to wear attire of Adidas, the league's official apparel provider. A recording of Garner's arrest showed him gasping, "I can't breathe" during the fatal encounter, and thousands have protested a grand jury decision not to indict the officer since the announcement on Wednesday. Irving also said his thoughts were with Garner's family. "What happened is a tragedy, I feel terrible about it, but my emotions are just more or less condolences for the family," Irving said.